From Goodreads.com: After twenty-five years with Sam, their lives revolving in circles that barely touched let alone overlapped, was it time Margie consigned their marriage to an album of faded photographs? 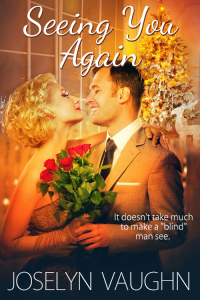 The Christmas ball at her mother-in-law's retirement home would either be the final straw for their failing marriage or the perfect chance to reignite the old flame. Can the happy-go-lucky shenanigans of the retirement community remind Margie and Sam that falling in love has no age limit? This story fell in between for me. I didn't love it, nor did I hate it. To begin with, it IS a novella. It is only 51 pages long, and therefore can be read in one sitting. And while it was well-written for a short story, I didn't feel a connection to the main characters. Instead of feeling like I knew them and could root for them, I felt like I wasn't getting the whole story. I didn't feel that desire to see them work things out - in fact there were instances where I felt like smacking the heroine, because had she just taken the time to talk to her husband, some things could have been resolved. The same goes for the Hero, as he was just as guilty as she was about assuming things. However, the overall atmosphere of the retirement home and the humor the author included are what made this story most enjoyable to me. I just wish we would have gotten more about the characters, but alas, that is the downfall of the novella. On the flip side of everything, I believe that there will be people out there that can relate to this story. As marriages go on, sometimes the spark and passion is lost in the hustle and bustle of daily life, so I think a story such as this will appeal to those people. It dealt very opening and honestly with what a lack of communication can do, and the scenario presented was a very real one. Overall, I do believe that this story will appeal to a variety of people. Especially those that enjoy a quick, clean romance full of humor.